Despite competition from the second game of the World Series, Comcast's CMCSA CNBC could see an advertising sales windfall when it hosts the third Republican presidential debate. CNBC may have as much riding on Wednesday night's debate as some of the candidates themselves. Despite competition from the second game of the World Series, Comcast's (CMCSA - Get Report) CNBC could see an advertising sales windfall when it hosts the third Republican presidential debate. The business-news channel is also hoping for the kind of ratings boost that 21st Century Fox's (FOXA Fox News and Time Warner's (TWX CNN got from hosting the previous two debates. The big draw in all the debates has been Donald Trump, the real estate developer and reality-TV star, and to a lesser degree, Ben Carson, the Baltimore neurosurgeon who has just replaced Trump as the GOP frontrunner in national polls. Neither man has ever held elective office. CNBC has been selling 30-second commercials for the debate at $250,000 or higher, 25% above what CNN received for its three-hour GOP debate Sept. 16, according to The Hollywood Reporter. For CNBC, the live event also offers a chance to expand its audience beyond business people and investors. "CNBC has a much more specialized audience, with viewers actively involved in finance and trading," said Gabriel Kahn, a professor at the University of Southern California's Annenberg School for Communication and Journalism. "This is an opportunity for CNBC to get a broader array of viewers. CNBC would have to work really hard to flub this debate." Fox News drew 24 million people for the first GOP debate, while CNN drew 23 million viewers, a record for the network. CNBC could use a boost in ratings and revenue. Comcast's cable networks were the only underperforming part of the sprawling Philadelphia-based media and broadband company's financial results in the third quarter, Comcast said on Tuesday. Overall, ratings at its cable-TV channels -- which include Bravo, Sprout and USA -- dropped, while advertising revenue rose a mere 2% from a year ago. That's not enough to cover higher programming and other costs as cash flow declined. Wednesday's debate from Boulder, Colorado, will focus on the economy and financial issues. CNBC bills it as "Your Money, Your Vote" and is hoping to easily beat its previously top-rated GOP debate, which drew 3.1 million viewers in 2011. "CNBC is much smaller, when to comes to ratings, compared to other cable news networks," said Kahn. Adweek ranked CNBC as No. 46 in primetime cable channel ratings for the month of October, averaging 338,000 viewers. MSNBC ranked No. 25, CNN ranked No. 12 and Fox News ranked No. 3, averaging 1.76 million viewers, according to compiled Nielsen data. The debate will be moderated by CNBC's Carl Quintanilla, co-anchor of Squawk on the Street and Squawk Alley, Becky Quick, co-anchor of Squawk Box, and Washington, D.C., chief correspondent John Harwood. Though they are less well-known than Fox News debate moderator Megyn Kelly or CNN's Anderson Cooper, their profiles will be raised with the bigger audience. While CNN live-streamed its debate for free, CNBC -- like Fox -- will limit live-streaming to viewers with cable TV subscription. CNBC also offers CNBC Pro, which includes a free seven-day trial and goes for $29.99 a month. Kahn also noted that debate clips that run other networks with the CNBC logo will only increase the network's exposure. Some cable subscribers may not even realize they get the channel. With the debate focusing on everything from taxes to retirement -- and two corporate executives among the candidates (former Hewlett-Packard CEO Carly Fiorina is the other besides Trump), CNBC has a chance to to highlight its expertise on financial matters. "Republicans have two former businesspeople running on their record. Hopefully, CNBC can shed some more insight on that end of the campaign, on the economy," said Kahn. 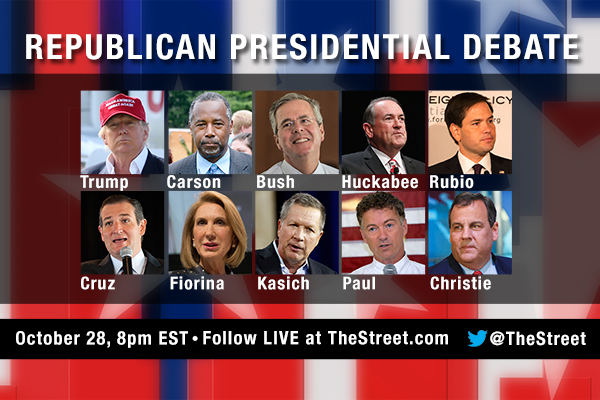 The next Republican Presidential debate starts at 8 p.m. ET Wednesday, Oct. 28, but TheStreet.com will be covering it all week! Tune in for stories, videos, and more, and make sure to follow us at @TheStreet on Twitter for live commentary during the debate.